← Is PQQ The Fountain of Youth? 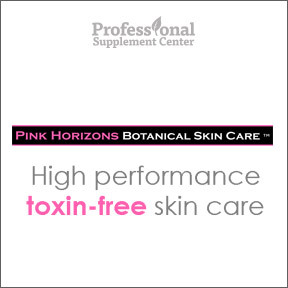 Professional Supplement Center now carries Pink Horizon’s Botanical Skin Care™, a line of botanical skin care products that takes an integrated, holistic approach to overall health and wellbeing. Pink Horizons utilizes safe, natural, sustainably-sourced organic ingredients chosen for their therapeutic and nurturing properties. Their high performance powerful products contain pure and multi-beneficial ingredients, including essential oils, herbal and botanical extracts, vitamins, minerals, amino acids and probiotics to effectively restore the skin and maintain the skin’s natural protective barrier. As our skin is a dynamic, functioning organ that absorbs nutrients as well as toxins, all products are formulated to be free of harmful chemicals, including petroleum-based ingredients, parabens, phthalates, sulfates, artificial colors and synthetic fragrances. These exceptional quality products take a holistic approach to healthy skin care not only by providing products with pure, safe and effective ingredients but also by supporting sustainably sourced and fair trade initiatives. Their guaranteed fresh ingredients are either Certified Organic, wild harvested or cultivated without chemicals according to organic standards. Bio-Nutrient Cleansing Milk – This 95% organic formula, designed for mature skin, contains a unique combination of plant oils and exceptional ingredients that deeply cleanse, nourish, rehydrate and balance the skin, while increasing the skin’s ability to absorb nutrients. Ingredients include castile soap, calendula oil, chamomile extract and bergamot and lemongrass essential oils. Gluten and toxin free, eco-friendly, cruelty free, vegan formula. BioFactor Collagen Gel – This 100% naturally sourced, 89% organic formula increases the skin’s ability to retain moisture, restores suppleness and aids in reducing fine lines and wrinkles. Ingredients include 10% plant derived collagen mimicking proteins, aloe vera, and cedar wood and lemon essential oils. Cell Defense Serum for Mature Skin – Formulated to protect, moisturize, regenerate and deeply penetrate the skin, this product provides ingredients that nourish, balance, soften, hydrate and repair the skin at the cellular level and support the skin’s natural potential to heal itself given appropriate nutrients. 100% naturally sourced, 99% organic, gluten and toxin free, eco-friendly, cruelty free, vegan formula. This entry was posted in Home and tagged Bio-Nutrient Cleansing Milk, BioFactor Collagen Gel, Cell Defense Serum for Mature Skin, Pink Horizon's Botanical Skin Care, Professional Supplement Center, skincare, Vitamins and supplements, www.professionalsupplementcenter.com. Bookmark the permalink.